The Play House Group runs six children's activity centres scattered around Hong Kong. Each centre is unique with its own different theme and contains comprehensive educational toys and apparatuses to ensure your child has fun while being productive. Listed below are descriptions of three centres. To learn more about the Play House Group and its other locations, please visit its website. Play House, Tsuen Wan Play House’s fourth kids activity centre features a yellow bus theme and boasts more than 5,000 sq. ft. of open play space. The centre consists of eight challenging and exciting play areas and places special focus on sports, games, and family fun. More info: http://www.playhouse.com.hk/tsuenwan/english Play House E Cube Club, MegaMall, Kowloon Bay The E stands for: entertainment, education, and exchange. 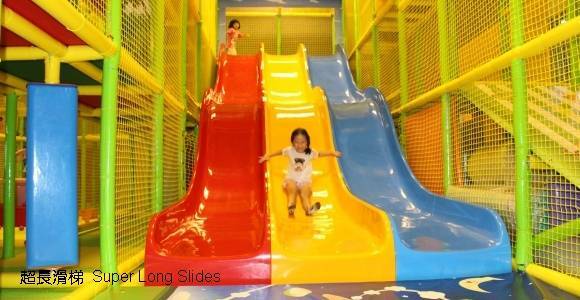 The club fosters a friendly atmosphere where young children can play in a mega-sized indoor playground divided into ten fun, yet challenging play zones. Special highlights of the club includes a sea view, 11,000 sq. ft. of play area (can accommodate 400 guests), and uses “Shang” anti-bacterial air diffuser to keep the air fresh and germ-free. More info: http://www.playhouse.com.hk/megabox/english Play House, North Point This indoor playhouse is inspired by the skies and features 11 exciting play zones: Play House Sky City, Aeroplane Chess Zone, Sky City Maze, and more. Other highlights include a giant play ball pit and a ball shooting zone – perfect for your active toddlers! More info: http://www.playhouse.com.hk/northpoint/english Other Play House locations include: Hung Hom, Yau Tong, and Yuen Long.